No clear front-runner has emerged days before the State Republican Executive Committee meets to vote to replace Texas GOP chairman Steve Munisteri. 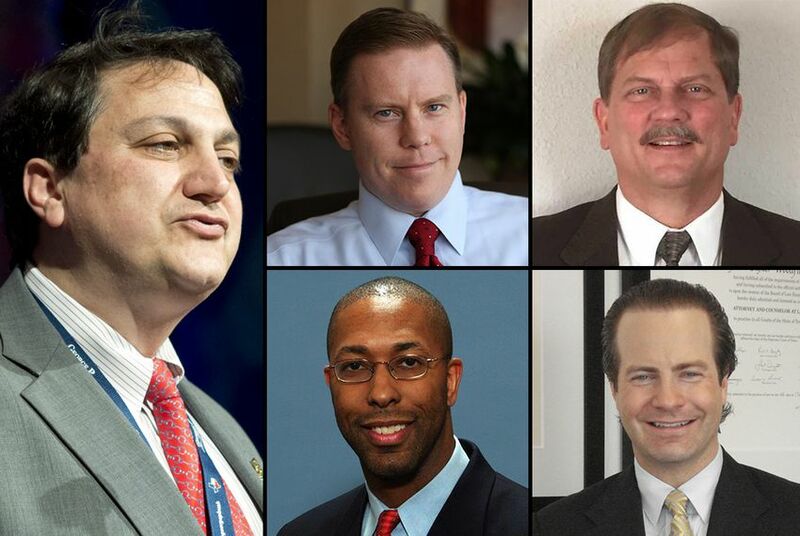 With two days until 60-some Republicans vote to replace state GOP chairman Steve Munisteri, the race has increasingly centered on a question that not even some candidates can seem to answer: Who is the front-runner? “I have no idea how things are going to go,” said Robin Armstrong, one of four declared candidates looking to capture the post, which Munisteri is vacating to join U.S. Sen. Rand Paul's likely 2016 presidential campaign. Armstrong's view is one shared to varying degrees by other candidates, party activists and members of the State Republican Executive Committee, which will meet Saturday to pick Munisteri's successor. In addition to Armstrong, the Republican National Committeeman from Texas, their choices include Dallas County GOP chairman Wade Emmert, Texas GOP treasurer Tom Mechler and Jared Woodfill, former chairman of the Harris County Republican Party. Whoever is selected Saturday will serve as interim chairman until delegates to the state convention settle on a permanent replacement for Munisteri next May. The 14-month period promises to entail intensive fundraising for the convention and positioning the party for a 2016 presidential race that could feature several Republicans with Texas ties. Complicating the political prognostication is the unique method of voting that will be used Saturday. The State Republican Executive Committee will hold as many rounds of secret-ballot voting as needed before a candidate earns the support of a majority of the 60-some voting members. Behind-the-scenes jockeying is expected as the candidates size up their support and decide whether to stay in. A pair of straw polls separately conducted last month provided little clarity for those looking for a front-runner. Armstrong easily won one of them, with Emmert and Mechler one vote apart in second and third places, respectively. In the other straw poll, Armstrong and Woodfill tied for first, with Emmert two votes behind them. “March 7 is going to be fun,” he added. One thing, however, is clear to Texas Republicans following the race: Whoever wins has big shoes to fill. Munisteri is widely credited with restoring the party’s fiscal health and guiding it to resounding victories across the state last November, despite a high-profile push by Democrats to make the elections more competitive. “He will be the toughest act to follow of anybody I have seen in Republicans politics in Texas in a long, long time,” said Bill Crocker, a former Republican National Committeeman from Texas who is supporting Emmert. Armstrong is pitching himself as a “consensus candidate” who can bridge the gap between different wings of the party. He points out that he already has been elected by the delegates to the state convention, a stamp of approval from the party’s grassroots. Seen as rising star in Texas politics, Emmert is staking his candidacy on making the party more inclusive and even open to those who disagree with major planks of the platform. As the leader of one of the state’s largest county parties, he argues he has the experience needed to balance competing interests within the party. "The party can be more things to more people," Emmert said. "We need to break out of a cycle where we only focus on certain things." Mechler, the state GOP treasurer, has positioned himself as the most trusted steward of the party’s finances in the post-Munisteri era. That argument occasionally has included reminders of the Texas GOP’s darker days, when the party was hundreds of thousands of dollars in debt. “We cannot go backwards. The chairman of this party will determine whether or not that’s a possibility based on the leadership of where we come from and where we’re going,” Mechler said last month during a debate in Euless. Woodfill, the former Harris County GOP chairman, has preached loyalty to the party platform, an ideological road map that was criticized last year for its hardline stances on some issues. Considered a favorite of social conservatives, he also has promised involving the church more in the party’s activities. “I think it’s a winning platform, I think it’s a platform we should embrace — we shouldn’t be ashamed of it — and we should take it to communities that don’t always vote Republican," Woodfill said. Woodfill might be the most polarizing figure in the field, a crusading lawyer whose critics say his emphasis on ideological purity and sometimes rocky tenure in Harris County are disqualifying. But he is not the only candidate with detractors on the factionalized executive committee. As a Republican National Committeeman, Armstrong has not been as involved in the grassroots of the state GOP as other candidates, according to some critics. Emmert's focus on drawing more people to the party has raised the question of whether it can be too welcoming and lose sight of its principles. And Mechler's perceived support in the past for the Texas Solution still angers some of the more conservative members of the party. The candidates will have one last chance to make their cases Friday night during a forum held in Austin sponsored by the party.